The 56 men who disappeared into the sea were Kamikaze Special Attack Corps airmen from Tokushima Air Base who made nighttime sorties in two-man Shiragiku trainers in May and June 1945. Kochi Air Base also lost 52 airmen in suicide attacks by Shiragiku (meaning "white chrysanthemum") trainers during the same two months, but this book focuses on the story of the airmen from Tokushima. The cover indicates that the book's audience is upper elementary grades and above, but adults also could find value in this book with its fascinating personal stories about Shiragiku kamikaze airmen rarely covered in other books. However, despite interesting history and personal stories, the book rambles with no clear direction in some parts, especially near the end, but the author generally stays within the scope indicated by the book's subtitle: Naval Special Attack Corps Tokushima Shiragiku Unit. Five years before publication of this book, Ochiho Shimahara wrote another children's book, entitled Shiroi kumo no kanata ni: Rikugun koukuu tokubetsu kougekitai (To the distant white clouds: Army's aerial special attack corps), about individual pilots who made sorties from Chiran Air Base. Her interest in the Shiragiku Special Attack Unit came about as she wanted to know more about why young men would be sent out in trainers on suicide attacks when it was already known that Japan would lose Okinawa. This history of the Tokushima Shiragiku Unit follows a similar pattern as the author's first book, where Shimahara provides some background information in the first part of the book, but most of the rest covers personal interviews in somewhat desultory fashion. She interviews various Tokushima Shiragiku Unit survivors and family members of men who died in attacks. At times the author's strong anti-war sentiment shows through, although generally she objectively presents the material. Some comments seem to be directed at her intended audience of children, such as when she expresses her view that Japan was the aggressor during World War II and that peace does not really exist today because of the high military-related expenditures made by Japan (p. 177). The Tokushima Air Base Shiragiku Unit made five separate attacks from Kushira Air Base in southern Kyushu, while the Kochi Air Base Shiragiku Unit made their sorties from Kanoya, just a short distance from Kushira. Chapter 3 covers the sortie from Kushira of the 1st Tokushima Shiragiku Squadron on May 24, 1945, in which 18 men in 9 trainers lost their lives. The 14 trainers in the 1st Tokushima Shiragiku Squadron had to fly at night, since American fighters could easily destroy the slow-moving planes that took about five hours to reach Okinawa from southern Kyushu. 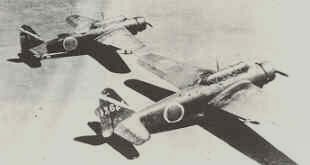 Three planes of the 1st Tokushima Shiragiku Squadron returned to base due to engine or other mechanical problems, so originally it was thought that 22 men in 11 trainers had died in attacks, but some time afterward it was discovered that two planes made forced landings near Iojima, a small island about 50 kilometers from Kyushu, and the crewmembers survived. Chapter 5 describes the sorties of the 2nd and 3rd Squadrons on May 27 and 28, respectively, and Chapter 6 tells about the 4th and 5th Squadrons that made sorties on June 21 and 25, respectively. The author describes in Chapter 1 how she heard about the Shiragiku Special Attack Squadrons and gives a brief overview of their training and final missions. Chapters 2, 4 (somewhat misplaced between Chapter 3 on the 1st Tokushima Shiragiku Squadron and Chapter 5 on the 2nd and 3rd Squadrons), and 7 give respectively some general background on WWII, naval training of pilots and navigators, and the month when the war ended. Chapters 8 to 14 contain various personal stories, although the first seven chapters also contain reminiscences from many veterans interviewed for the book. Shimahara used family records of the Tokushima Air Group Association to try to visit many family members of men who had died in the kamikaze attacks of May and June 1945, and the last seven chapters include their stories about the family members who died in the attacks. Japanese sources (e.g., Tokkotai Senbotsusha 1990, 205-10; Osuo 2005, 241-3) indicate that only 55 men from the Tokushima Air Group died in special attacks (tokko in Japanese). The missing person from the lists is one pilot, Lieutenant Junior Grade Yoshiyuki Tanigawa, of the 5th Tokushima Shiragiku Squadron that sortied from Kushira on June 25, 1945. When his plane ran out of fuel after departing Kushira, he made a forced landing in the sea off Takarajima, a small island about halfway between Kyushu and Okinawa. He died when his plane that hit the water went up in flames and sank, but his plane's navigator, Lieutenant Junior Grade Tokuichi Shikatani, managed to escape and make it to shore despite having a dislocated shoulder. The Navy generally considered a person to have died in a kamikaze special attack if the person died after taking off in an aircraft designated for a special attack mission, but for some unknown reason Tanigawa never received credit, including a two-grade promotion, for death in a special attack. This fact troubled Shikatani even when the author interviewed him over 40 years after the end of the war (p. 106), "Perhaps the way I made my report was bad, and Tanigawa did not become a special attack death. Since he boarded a special attack plane and was sent off, it is a special attack death. Since he took off carrying a bomb, it is a special attack death wherever you die." Despite Tanigawa not being credited with a special attack death, other men who took off in planes designated for special attacks but who died in crash landings were credited. For example, Flight Petty Officer 2nd Class Junichi Yamagishi, pilot of a plane of the 3rd Tokushima Shiragiku Squadron, lost his life in a forced landing near Iwotorishima and was credited with a special attack death, but the plane's navigator Flight Petty Officer 2nd Class Shoji Nakayama escaped with his life (pp. 83, 91). This inconsistent treatment may have resulted from the timing of the reports from the surviving crewmen, or it could be that the Navy did not have a detailed definition of special attack death to cover a situation where a survivor in the same aircraft could report that a crewman died but did not reach a designated battle area. After Shikatani reached the shore of Takarajima despite his dislocated shoulder, he was relieved to find the island occupied by Japanese. The small island had a naval radar base, and the commander gave him food and treatment for his wounds. A noncommissioned officer massaged his shoulder and put it in a splint. When his hand could move and he felt his wounds had sufficiently healed, he departed the island in a small boat with a sail provided by the islanders because he wanted to return to Kushira Air Base. This was in the beginning of August 1945, more than one month from when he had crashed into the sea. He could not sail during the day since American planes flew overhead, so at night he took the boat from one small island to the next on his way back to Kyushu. After more than a month, he finally reached Makurazaki at the southern end of Kyushu, but he then found out that the war had already ended. 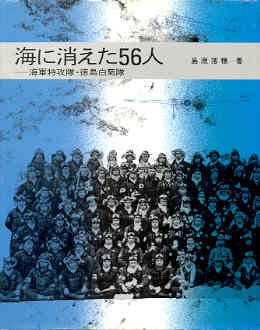 In addition to the account by Tokuichi Shikatani, Umi ni kieta 56nin (56 men who disappeared into the sea) contains many other fascinating personal stories based on the author's interviews. The author also visited the Kushira Naval Air Base War Dead Memorial Tower, the place where the 56 men who perished took off on their special attack missions. She also went to the Tokushima Air Base Museum, which has photos and displays of other items about the Tokushima Shiragiku Unit. The museum also has the Tokushima Air Group Memorial Kannon (Goddess of Mercy), with a small Shiragiku crewman standing in her right palm, to remember the 56 men who died in battle and other men of the Tokushima Air Group who died in ways other than special attacks such as training accidents and American air attacks on the base. Although this children's book wanders from topic to topic in much the same way as Shimahara's first book on Chiran written five years before, this history contains many captivating stories about the 56 men from Tokushima Air Group who disappeared into the sea. Osuo, Kazuhiko. 2005. Tokubetsu kougekitai no kiroku (kaigun hen) (Record of special attack corps (Navy)). Tokyo: Kojinsha.